The tactical backpack by Trekking King is a brand new product that was carefully designed for trekking, hiking, traveling, fishing, hunting and many other outdoor enthusiasts everywhere. Thanks to its high functionality and durability, this military backpack can be easily used as a 3-day assault pack, army rucksack or bug out bag. Our military backpacks are produced from high-quality water-resistant 1000D Oxford material. Keep your stuff dry and ready to use with heavy-duty zippers and rain diverting flaps. This molle army pack features a large main compartment big enough to store a laptop, one front pocket and two side pouches with an overall capacity of 60L. The efficient and practical molle system enhances its storing capabilities. The easy-to-use design allows you to attach a large number of tools and other objects, like tents, sleeping mats and many other essential items. Fully adjustable shoulder, chest and hip straps combined with a handy holder and padded back area make our backpack extremely comfortable to wear. We are so sure you'll love the quality of this wonderful tactical rucksack, we offer an incredible one year warranty with it. If something goes wrong contact our support team for a replacement or a full refund. ADD the best military backpack from Trekking King Gear to your CART right now! SPACIOUS AND CONVENIENTLY SIZED - Tactical Backpack Size: 20"*16"*10.5"/ 40.4*50.8*26.6CM (L*W*H), Capacity: 60L. This military backpack is made of high quality and water-resistant 1000D oxford fabric for durability that's conveniently sized. 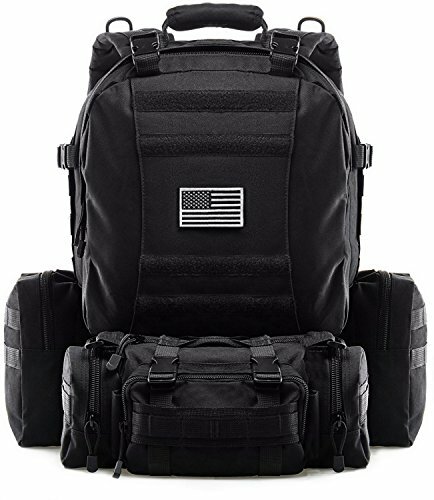 PRACTICAL AND MULTI-FUNCTIONAL - This tactical military backpack is perfect for any outdoor activity, including are camping, hiking, traveling, trekking, etc. Going on a vacation, to school or just shopping? This multiuse backpack can fit all of your needs no matter what they are! EFFECTIVE MOLLE SYSTEM - Our molle system allows you to easily attach any additional loads, gear or pouches for a highly practical backpack that's also multifunctional! DURABLE AND RELIABLE - Our hiking bag is double-stitched complete with a padded back area, heavy duty zippers and rain diverting flaps to keep the insides dry all the time. Made for all kinds of weather, this military backpack is made to last in all conditions! 100% RISK-FREE PURCHASE - We are completely confident in the quality of our product, that's why we are offering an incredible ONE YEAR WARRANTY with our military backpack. Feel free to contact us if you have any issues with your order. We'll replace or refund your purchase hassle-free! If you have any questions about this product by Trekking King, contact us by completing and submitting the form below. If you are looking for a specif part number, please include it with your message.